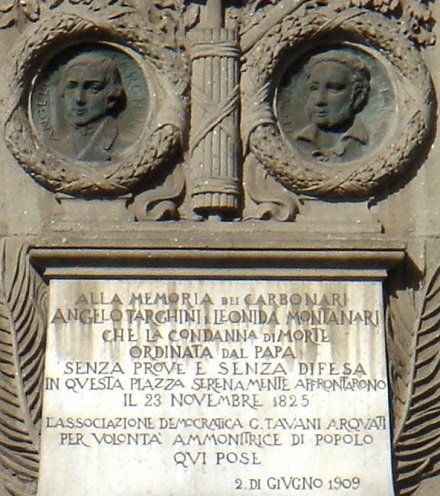 On this date in 1825, alleged carbonari plotters Angelo Targhini and Leonidas Montanari were guillotined by Papal executioner Mastro Titta. This excommunicate revolutionary secret society was spending the 1820s — a decade in-between revolutions — harrying the restored crowned heads of Italy and France with assassination plots. It was accordingly much-harried in its own turn, to the repeated profit of this grim chronicle. The pair we feature today were casualties of all that cloak-and-dagger, specifically the latter. 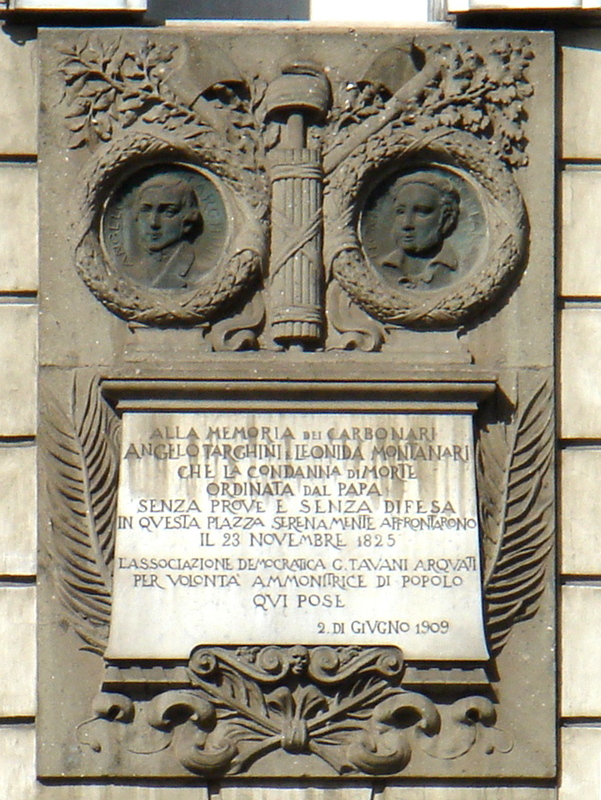 The story (Italian link) goes that the Carbonari became convinced (correctly) that one of their number, a Filippo Spada, was informing against them; thereupon, our Angelo Targhini — very much the impressionable young zealot — was tasked with stabbing the turncoat to death in an alley. The victim, known familiarly as “Spontini”, survived the attack. Montanari, a physician, was one of the first on the scene but arriving policemen perceived that the “treatment” he was applying to the victim was actually deepening his wounds, and seized him as a conspirator. Montanari admitted nothing of the kind and was accused solely on the impressions of police plus the information of another informant. But he was in no position to impeach this information because it was a secret court of the automcratic Pope Leo XII that condemned both men for treason — solicitous of neither defense nor appeals. In his diaries, as detailed here as ever, the headsman Mastro Titta reports receiving death threats. Security on the Piazza del Popolo, “thick with people, as I never saw her,” in Titto’s words, was extremely tight — but no public disturbance or carbonari raid disturbed proceedings. That was left only to the prisoners, who declined to receive the sacrament of confession or acknowledge themselves assassins. The young men are the subjects of the 1969 Luigi Magni film Nell’anno del Signore.